Although it looks very professional, the raised-panel door is not difficult to make. Just take your time and measure the pieces exactly. There are four raised panels, all fitted into an outer frame. Start by cutting four panels (K) from 1x8 pine, each measuring 7 by 14-5/8 inches. 15 degrees off vertical, and make a 2-inch-long bevel on all four edges of each of the four panels (K). The remaining thickness of the cut side should be 1 / 8 inch. 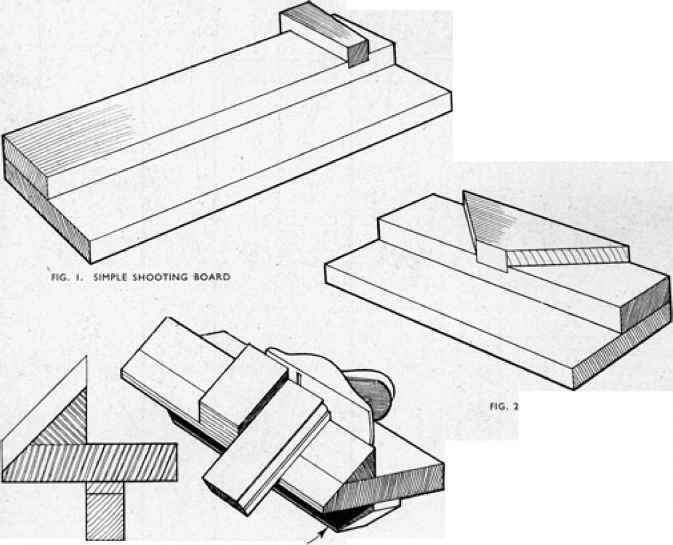 A diagram of the resulting cut is shown in Figure 4. 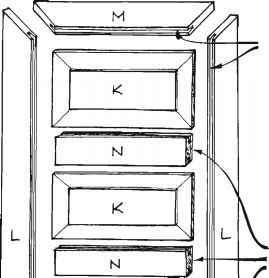 The assembly of the panels within the outer frame is shown in Figure 5. To make the frame, rip a total of 13 linear feet of 1 x 4 pine to a width of 2 inches. Cut two side frame pieces (L) from the ripped 1x4 pine, each 35-1/2 inches long. Setting each side frame piece (L) on its face, miter both ends at a 45-degree angle as shown in Figure 5. Cut two top/bottom frame pieces (M) from the ripped 1x4 pine, each 18 inches long. Setting each top/bottom frame piece (M) on its face, miter both ends at a 45-degree angle as shown in Figure 5. Cut three inner frame pieces (N) from the ripped 1x4 pine, each 14 inches long. Cut a dado 1/4-inch wide and 3/8-inch deep into both edges of all three inner frame pieces (N). To make certain that all pieces fit together perfectly, the door should first be assembled without glue or nails. Lay all of the door parts on a level surface. Then, referring to Figure 5, place the top frame (M) between the two side frames (L), and match the miters. Set the first panel (K) into the dadoes in the frame pieces (L and M), and fit one inner frame piece (N) between the side frame pieces (L) below the panel. Next, alternately add three more panels (K) and two more inner frame pieces (N). finally add the bottom frame piece (M). When you are satisfied that all of the pieces fit correctly, glue and clamp the assembly together and let it sit for a few hours. Glue only the frame pieces together; the panels should float freely in the dadoes. Reinforce the four corners and each of the inner frame pieces (N) with 8-penny finishing nails.